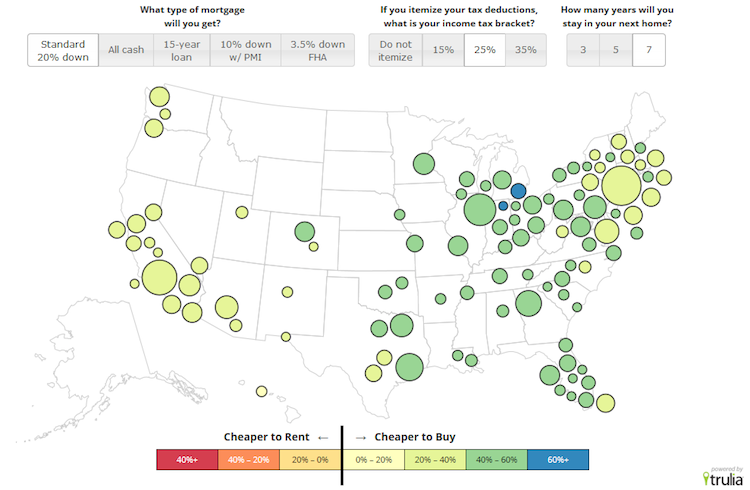 Nationally, buying is 38% cheaper than renting with a traditional 20% down, 30-year mortgage. Buying is an even better deal with a 15-year mortgage, but not as favorable with less money down. Homeownership remains cheaper than renting nationally and in all of the 100 largest metro areas. 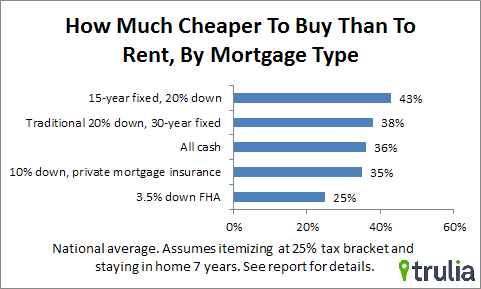 In fact, buying is 38% cheaper than renting now, compared with 35% cheaper than renting one year ago. Why is the gap widening? Two reasons. First, in the past year, the 30-year fixed-rate mortgage rate has fallen from 4.8% to 4.3%. Second, rents have risen faster than prices, excluding foreclosures. Together, these trends have made buying even more affordable versus renting than it was last year. Our Rent Versus Buy model assumes a traditional 30-year fixed rate mortgage with a 20% down payment. But there may be good reasons for financing a home purchase other ways. Consumers tell us that the main obstacle to homeownership is the down payment. For those would-be homeowners – especially first-timers without savings or equity from another home – a low-down-payment mortgage might be the only option. For others, paying all cash might give them the deciding advantage over other bidders on a house. This edition of Trulia’s Rent Versus Buy report focuses on how different types of mortgages affect the math of buying versus renting. Calculate the average rent and for-sale price for an identical set of properties. For this report, we looked at all the homes listed on Trulia for sale or rent from July, August, and September 2014. 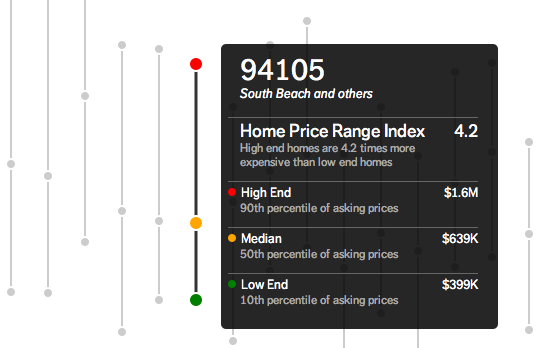 We estimate prices and rents for similar homes in the same neighborhood to get a direct apples-to-apples comparison. We are NOT just comparing the average rent and price of homes on the market. 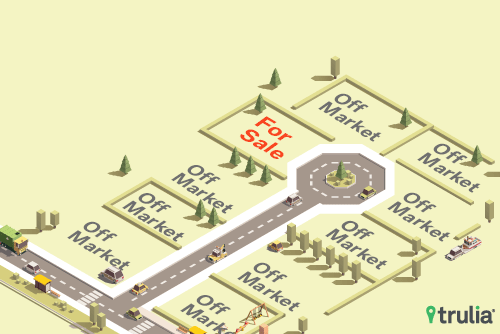 That would be misleading because rental and for-sale properties are very different. Most importantly, for-sale homes are on average about 50% bigger than rentals. Calculate the initial total monthly costs of owning and renting, including mortgage payments, maintenance, insurance, and taxes. Calculate the future total monthly costs of owning and renting, taking into account price and rent appreciation as well as projected inflation. Calculate net present value to account for the opportunity cost of using money to buy a house instead of investing it. Net present value is the value in today’s dollars of a future stream of payments and proceeds, taking into account expected interest rates. To compare the costs of owning and renting, we start by assuming that buyers get a 30-year fixed-rate mortgage at a 4.3% rate and make a 20% down payment. We then compare this mortgage with several other financing options, including all cash and an FHA loan. We assume people itemize their federal tax deductions and are in the 25% tax bracket. We also assume they stay in their home for seven years. In short, our Rent Versus Buy model takes into account all costs and proceeds from buying or renting over an entire seven-year period, including opportunity cost. 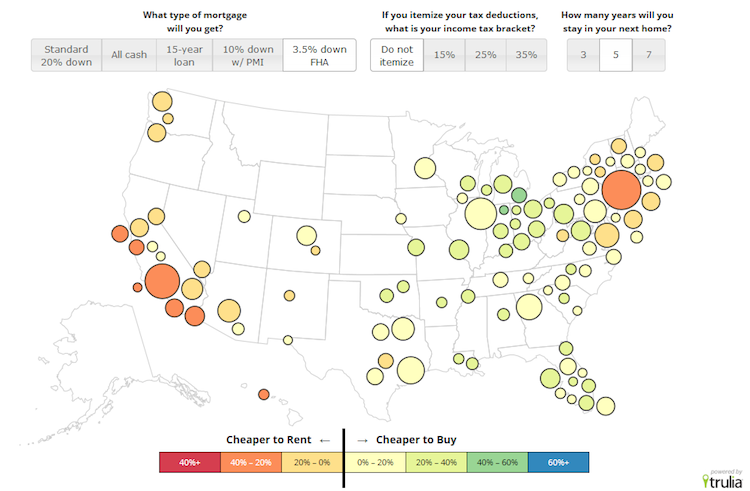 The interactive Rent Versus Buy map shows how the math changes under alternative assumptions for the mortgage rate, the income tax bracket for tax deductions, and the number of years that one stays in the home. What’s more, Trulia’s Rent Versus Buy Calculator lets you compare renting and buying costs based on whatever assumptions, prices, rents, and scenarios you want to look at. It uses the same math that powers our interactive map and this report. Our detailed methodological statement explains it fully. Buying is 38% cheaper than renting nationwide, and buying is cheaper than renting in all of the 100 largest metros. In fact, buying is at least 20% cheaper than renting under our baseline assumptions in all of the 100 largest U.S. metros except Honolulu. The gap in the costs between renting and buying differs across metros largely because each market has its own typical prices and rents. In addition, property taxes and home-price appreciation differ locally. Taking all these factors into account, buying ranges from 17% cheaper than renting in Honolulu to 63% cheaper than renting in Detroit. Generally, buying is a closer call relative to renting in California and New York, while the gap is widest in the Midwest and South. Even in the tougher-call markets, buying probably won’t become more expensive than renting soon. Home price increases are slowing. What’s more, at current prices and rents, mortgage rates would have to rise above 6% to make renting cheaper than buying in Honolulu. They’d have to climb near 7% for Orange County and San Jose to tip in favor of renting. The 30-year fixed-rate mortgage hasn’t been 6.1% since 2008. Nationally, buying is a bit more affordable compared with renting now (38% cheaper) than a year ago (35% cheaper), thanks to the decline in mortgage rates. But in parts of the West where rents have risen faster than for-sale prices, the cost gap between buying and renting has widened significantly. In our summer 2013 report, buying in San Jose and San Francisco was less than 10% cheaper than renting, compared with more than 25% cheaper now. Note: Negative numbers mean that buying costs less than renting. For example, buying a home in Detroit is 63% cheaper than renting in 2014. Trulia’s Rent Versus Buy calculation assumes a 4.3% 30-year fixed-rate mortgage with a 20% down payment, itemizing tax deductions at the 25% bracket, and staying seven years in the home. Click here to download the full Rent Versus Buy cost considerations for the 100 largest U.S. metros: (PDF) or (Excel). All the Rent Versus Buy calculations shown above assume a traditional 30-year fixed-rate loan with a 20% down payment. But many people can’t swing 20% down. Others might prefer to pay all cash or build equity faster. For those reasons, we examine other financing options. Let’s look at how different options play out for a $250,000 home that the owner sells after seven years. To keep things simple, let’s start out ignoring closing costs, home price appreciation, tax benefits, and many other things we do account for when we add these scenarios to our full Rent Versus Buy model, below. A traditional 20% down, 30-year fixed-rate loan on a $250,000 home would carry a $990 monthly mortgage payment, including principal and interest. After seven years, the unpaid loan balance is $173,291, leaving equity of $76,709. All cash is just what it sounds like. You pay $250,000 upfront and that’s all equity at the end. For a 15-year fixed-rate loan, you still put 20% down. The average mortgage rate on a 15-year fixed-rate loan is most of a full point below that of the 30-year fixed rate. But the shorter term means a higher monthly payment of $1,428. The payoff is that the 15-year loan builds equity much faster: $130,507 after seven years. A 10% down payment loan with private mortgage insurance requires less money upfront. But the higher initial loan balance means a larger monthly payment plus a mortgage insurance premium of $133 per month. Furthermore, the lower down payment and higher loan balance leave equity of only $55,048 after seven years. A 3.5% Federal Housing Administration (FHA) loan calls for a down payment of only $8,750 but requires upfront and ongoing mortgage insurance premiums. The higher initial loan balance means equity of just $38,748 after seven years. That’s about half what you’d have with a traditional 20% down, 30-year loan. Note: Monthly payment is principal, interest, and mortgage insurance premium. Mortgage rates for the traditional 20% down 30-year fixed (4.30%), 15-year fixed (3.48%), and FHA (4.00%) loans are from the Mortgage Bankers Association for the week ending October 3. We use the same rate for a 10% down payment loan as the traditional 20% down payment rate, based on current rate quotes. Monthly payment includes mortgage insurance calculated for the first year of the loan. For FHA loans, the insurance premium falls over time but remains on the loan; the FHA upfront premium is rolled into the loan balance. For the 10% down loan, we assume insurance gets taken off when equity reaches 20%. All dollar amounts are rounded to the nearest dollar. How do you decide whether buying still beats renting with each of these financing options? The math gets complicated. For starters, the benefits of each option depend on how you would invest your money if you weren’t buying a home – that’s the “opportunity cost.” In addition, other factors, such as whether you itemize your tax deductions, also affect the relative benefits. Our Rent Versus Buy model factors all this in. So let’s see whether buying beats renting in all cases. Remember that buying is 38% cheaper than renting nationally under our baseline model of a 20% down payment 30-year loan, tax deductions at 25%, and staying seven years. Let’s start by comparing the five financing options. In all scenarios, buying beats renting. The gap is widest for the 15-year loan, where it’s 43% cheaper to buy. It’s narrowest for the 3.5% FHA loan, where buying is 25% cheaper. The 15-year loan ends up costing least versus renting thanks to faster equity build-up and more of the mortgage payment going to principal rather than interest. 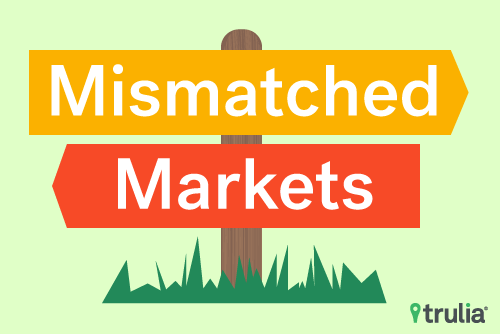 Surprisingly, all-cash is a worse deal than a traditional 20% down, 30-year mortgage, although that hinges on our assumption about what you could earn if you didn’t tie up your money in an all-cash payment. (Geeks: we’re assuming a 3.5% nominal discount rate.) In addition, if you pay all cash, you lose the tax benefit of deducting mortgage interest. If you assume tax deductions aren’t itemized, there’s no tax benefit of getting a mortgage, which makes all-cash a better deal than a traditional 20% down, 30-year fixed rate mortgage. The biggest shift is with the 3.5% down FHA loan, which makes buying only 25% cheaper than renting. In one of the 100 largest metros, Honolulu, buying with a 3.5% FHA loan is actually more expensive than renting. And, with this loan, buying beats renting only by 10% or less in San Francisco, New York, Los Angeles, and several other California metros. So, to buy or to rent? Falling mortgage rates and rising rents mean that buying looks even better versus renting than one year ago, especially in California. But buying is not for everyone. 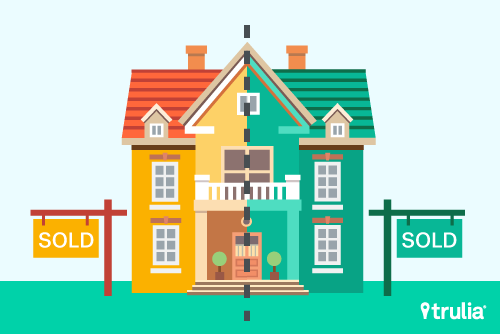 If you live in a market that’s a close call, and you plan to stay less than seven years, don’t itemize your tax deductions, or need an FHA loan, buying might not be the clear-cut winner. Indeed, if many or all of these things apply to you, buying could end up costing far more than renting. Buying may be 38% cheaper than renting nationally. But there are still plenty of people for whom renting would cost less than buying, even if low down payment loans give them the option to buy. What direction is your market looking?